A few of Pine Knoll Shores residents and the fish they caught. Issues of the Pine Knoll Shores newspaper, The Shoreline, from January to December 2017, are now online at DigitalNC, courtesy of the History Committee of the Town of Pine Knoll Shores. These new issues join over four decades of The Shoreline that have been added to DigitalNC over the last few years. 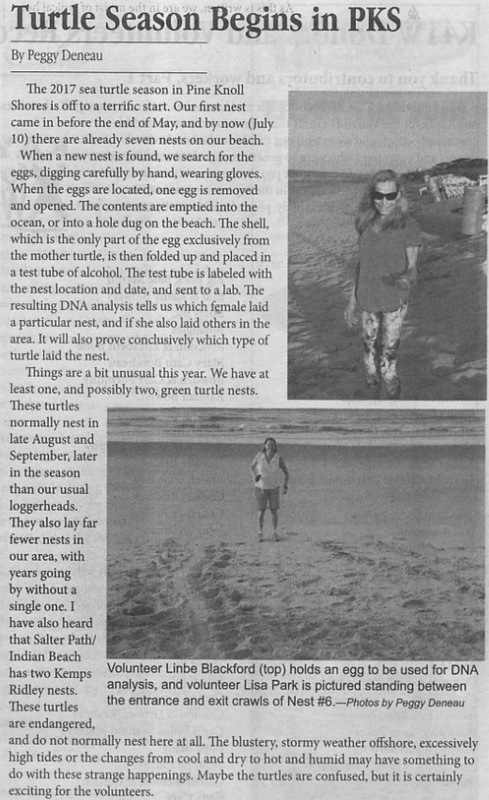 The Shoreline is a monthly newspaper that covers different parts of life in the Pine Knoll Shores area, including articles on community events and groups like the local Women’s Club or Garden Club, stories about the local businesses, news from the mayor and local county commissioners meetings, and book reviews. It also includes tips and helpful advice for locals, such as investment information, and in one issue, advice on how to prepare a prime rib roast for the summer. Another article offered a list of activities around the area, including special programs at the North Carolina Aquarium at Pine Knoll Shores. Having these issues in our collection gives us a greater picture of what it means to live in a small coastal community. Click here to view nearly 40 years of The Shoreline. To learn more about the History Committee of the Town of Pine Knoll Shores, take a look at their partner page, or website.